Wikimedia Commons has media related to 1771. 1771 (MDCCLXXI) was a common year starting on Tuesday (dominical letter F) of the Gregorian calendar and a common year starting on Saturday (dominical letter B) of the Julian calendar, the 1771st year of the Common Era (CE) and Anno Domini (AD) designations, the 771st year of the 2nd millennium, the 71st year of the 18th century, and the 2nd year of the 1770s decade. As of the start of 1771, the Gregorian calendar was 11 days ahead of the Julian calendar, which remained in localized use until 1918. January 5 – Great Kalmyk (Torghut) Migration under Ubashi Khan from the east bank of the Lower Volga River back to the homeland of Dzungaria, at this time under Qing dynasty rule. January 9 – Emperor Go-Momozono accedes to the throne of Japan, following his aunt's abdication. February 12 – Upon the death of Adolf Frederick, he is succeeded as King of Sweden by his son Gustav III. At the time, however, Gustav is unaware of this, since he is abroad in Paris. The news of his father's death reaches him about a month later. March – War of the Regulation: North Carolina Governor William Tryon raises a militia to put down the long running uprising of backcountry militias against North Carolina's colonial government. March 12 – The North Carolina General Assembly establishes Wake County (named for Margaret Wake, the wife of North Carolina Royal Governor William Tryon) from portions of Cumberland, Johnston and Orange counties. Bloomsbury (later known as Wake Courthouse) is made the informal county seat. March 15 – Society of Civil Engineers first meets (in London), the world's oldest engineering society. May 11 – War of the Regulation: North Carolina Governor William Tryon marches his militia out of Hillsborough to come to the aid of General Hugh Waddell's beleaguered forces. Tryon's army stops at Alamance Creek, 5 miles (8.0 km) away from the Regulator army. May 16 – War of the Regulation: The Battle of Alamance commences after Regulators reject an appeal by Governor Tryon to peacefully disperse. Governor Tryon's forces crush the rebellion, causing many Regulators to move to frontier areas outside of North Carolina. May 23 – Battle of Lanckorona: A force of 4,000 Russians under Alexander Suvorov defeat a Polish formation of 1,300 men. May – The Three battles of Sarbakusa: an alliance of three of the most powerful aristocrats of Ethiopia – Goshu of Amhara, Wand Bewossen, and Fasil of Damot – defeats Ras Mikael Sehul and Emperor Tekle Haymanot I, taking control of Ethiopia. July 13 – Russo-Turkish War (1768–74): Russian forces occupy the Crimea under Prince Vasily Dolgorukov. July 17 – Bloody Falls massacre: Chipewyan chief Matonabbee, traveling as the guide to Samuel Hearne on his Arctic overland journey, massacres a group of unsuspecting Inuit. August 8 – The first recorded town cricket match at Horsham in England is played. September 8 – In California, Fathers Pedro Cambon and Angel Somera found the Mission San Gabriel Arcángel in what is now San Gabriel, California. 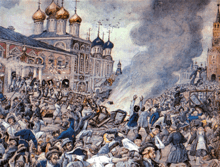 September 15–17 – The Moscow plague riot resulting from an outbreak of bubonic plague which kills 57,000. October 9 – The Dutch merchant ship Vrouw Maria sinks off the coast of Finland; Captain Raymund Lourens and his crew escape unharmed. November 16 – During the night the River Tyne, England, floods, destroying many bridges and killing several people; the replacement main bridge at Newcastle upon Tyne will not be completed until 1781. November 17 – Premiere in Milan of the opera Ascanio in Alba by Wolfgang Mozart, age 15. 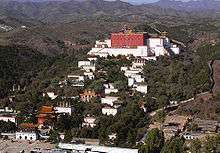 The Putuo Zongcheng Temple complex in Chengde, China is completed. The territory of Baden-Baden is inherited by Charles Frederick, Margrave of Baden-Durlach, reunifing the territories of Baden. The trade monopoly with Iceland is transferred to the Danish crown. The North Carolina General Assembly passes an act establishing the town of Martinsborough, named for Royal Governor Josiah Martin, on the land of Richard Evans, which will serve as the county seat of Pitt County. Construction of the Putuo Zongcheng Temple complex in Chengde, China is completed during the reign of the Qianlong Emperor. Limoges porcelain manufacture established in France. Slovene literature: István Küzmics, the Hungarian Slovene writer and evangelical pastor, publishes (in Halle) the Nouvi Zákon, a translation of the New Testament into the Prekmurje Slovene language, with discrete South Slavic artwork. ↑ Watson, Garth (1989). The Smeatonians: The Society of Civil Engineers. London: Thomas Telford. ISBN 0-7277-1526-7. ↑ Roberts, Gwilym (1995). From Kendal's Coffee House to Great George Street. London: Thomas Telford. ISBN 0-7277-2022-8. ↑ "Ukraine". World Statesmen. 2000. Retrieved 2011-11-01. ↑ "Horsham Cricket Club History". Horsham Cricket Club. Retrieved 2011-11-01. John Blair; J. Willoughby Rosse (1856). "1771". Blair's Chronological Tables. London: H.G. Bohn – via Hathi Trust.